Dynamix’s Industrial Agitators and Mixers utilize the most robust gearbox, bearings, and shaft configurations. Our Industrial Agitators also address ancillary needs such as efficiency, required reactions, environmental, and unique application factors. This is how Industrial Agitators are engineered into true heavy-duty mixing solutions the NMX Series. This agitator is specifically designed for heavy industrial mixing. Quality components and rugged construction produce long-term, trouble free operation. These agitators are both heavy-duty and high-efficiency. This mixer series is the powerhouse of our line of Industrial Agitators, and is typically applied in heavy industry such as Energy and Natural Resources, and large-scale chemical processes. Standard NEMA C-face motors with a power range from 1 to 75 HP. Other motor configurations are available. Gears are constructed of SAE 8620 steel, with a minimum 58 Rockwell hardness. Ground to AGMA 13 quality rating, the gears will provide long and quiet operation. The NMX Series features gear reduction ratios from 5:1 to 130:1, providing a wide-range of mixing speeds for all applications. A strong and rigid one piece housing design is crafted from SAE 30 gray iron, and features exceptional housing torsional stiffness and a thick housing wall section. Oversized, tapered heavy-duty output roller bearings are rated for an L-10 life over 100,000 hours, and can withstand the heaviest loads. Quardrillip output oil seal design protects assembly even in the harshest environments. Drywell seal option is also available. 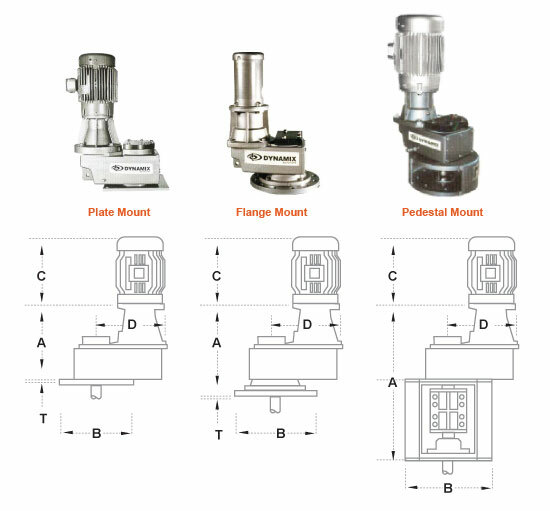 SHAFT MOUNTING Shaft mounting options available include hollow quill or solid shaft with flange coupling for ease of assembly in the field.Optional flange is available to allow quick disassembly of gearbox from mixer shaft for service. SERVICE FACTOR Based on motor horsepower, a minimum gearbox service factor of 1.5 ensures continuous long-term operation under heavy loads. The NMX Series features flexible mounting options fabricated from thick steel. Plate, Flange or Pedestal mounts ensure compatibility with a wide range of tanks and supports.Various sizes are available. All Dynamix shaft sizing minimum parameters meet or exceed industry standards and all shafts are designed to withstand torsional and bending loads. Our shafts are designed to run well below critical speeds and have a conservative slenderness ratio to eliminate excessive vibration.Solid shafts are standard, while a hollow shaft option is available for longer shafts. High-Efficiency DynaflowTM Dynamix Dynaflow impellers are extremely efficient producing a high-level of pumping per input horsepower. The best impeller for low viscosity blending and solid suspension applications up to 2500 cps.Pitch Suited for applications when a greater fluid shear level is required than a Dynaflow impeller can offer or for higher-viscosity applications.Radial A radial impeller is best suited for low-level liquid blending or high-shear mixing applications. Feel free to call us to discuss your specific impeller needs. Carbon steel and stainless steel are standard construction materials. Other materials and coating options are also available to address issues such as abrasion / corrosion resistance. Note: We do not have one single model for industrial agitators.